Dedicated parents and other AZC members have formed a Dharma School designed for children. If you have children and are interested in this kind of exploration of compassion and awareness, please contact us for more information. You may contact program coordinators Tim Jester and Annette Marley at tim.jester6@gmail.com or marley.annette@gmail.com. 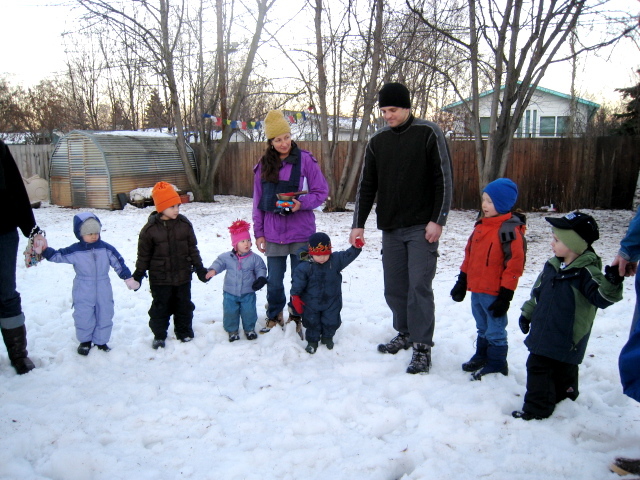 Since 2008, a vibrant group of eight to thirteen children and their parents—or other caretakers—have gathered for Dharma School each month at the Anchorage Zen Center. We have coordinated the event with several committed parents who regularly volunteer to bring snacks, assist with activities, and clean up AZC. The sessions are designed with 4-9 year-olds in mind, but we welcome children of all ages. The opening circle is always a special time as dharma school friends reconnect and welcome anyone who is joining us for the first time. Our attention then turns to the children’s altar for a generosity ceremony in which each child takes a turn placing an offering on the altar, bowing before and after doing so. The offerings have included such items as marbles, drawings, and favorite books. Next, we sit on zafus (cushions) in a circle and sing several songs together with Tim playing the guitar. Annette then leads the group in some simple yoga stretches, sometimes incorporating a theme from the day’s main lesson or activity; for example, when we were working with seeds, we did yoga poses resembling growing seeds. 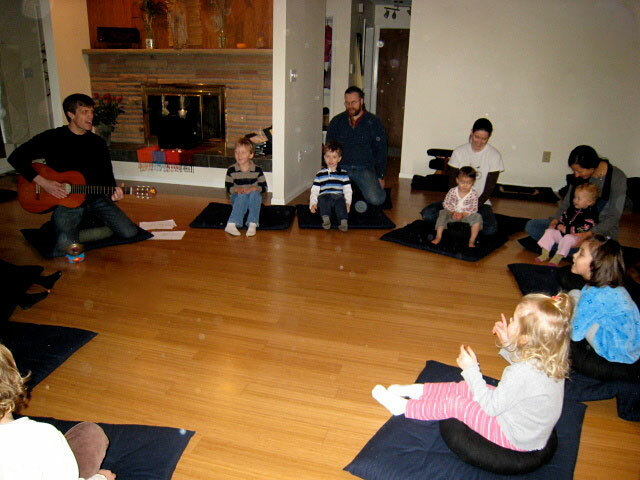 Following yoga, we settle down, with the children reminding each other the basics of sitting meditation (zazen): sitting upright, legs crossed, hands resting in our laps, and eyes softly focused in front of us. A child then rings a bell, and we all practice quiet sitting meditation for a minute or so. Although some rustling occurs, the children are earnest in their endeavor to sit and pay attention to their breath. The children then participate in a main lesson, which might be listening to a story, discovering seeds in a bag, or dramatizing the Buddha’s enlightenment. Over the years, we have focused on a few core themes—such as generosity, mindfulness, and compassion—explored through a variety of stories and activities. By this time, the children are usually ready for a snack, so we gather around a table or two, say a blessing, and then eat a healthy snack and drink fruit tea poured from an elephant teapot. Once the dishes are cleared away, we often work on some kind of craft related to the day’s main lesson, such as sculpting a Buddha statue from clay, creating pinecone birdfeeders, or making beeswax candles. Occasionally, we also participate in a Buddhist ceremony, adapted to be developmentally appropriate for children. For example, in celebration of Buddha’s birthday in the spring, we held a Bathing the Buddha ceremony in which children made tissue paper flowers to decorate a special altar with a small Buddha statue in the middle of a dish of sweet tea. 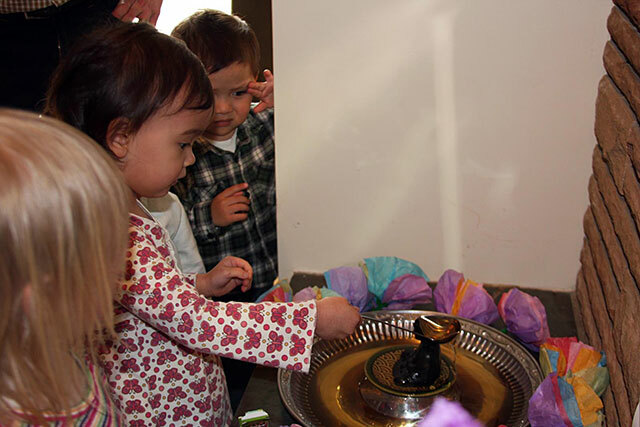 Each child then took a turn bathing the baby Buddha by dipping a ladle into the tea and pouring it over him. We ended the session by talking about how special it is to be born a human being and conveyed the Buddhist image of the turtle who surfaces every hundred years from the depth of the ocean and by chance pokes up his head through a ring floating on the surface. As the children left the zendo, each one swam like a turtle and surfaced through a small hula-hoop. May you be happy and everyone too.